NodeBots are robots that are controlled by Node.js. If you are interested in knowing a little bit more about them, I suggest you to read the article titled An introduction to NodeBots by Patrick Catanzariti . In this tutorial, we’ll make a simple NodeBot which can be controlled from the browser. The source code of the whole project is available on GitHub. 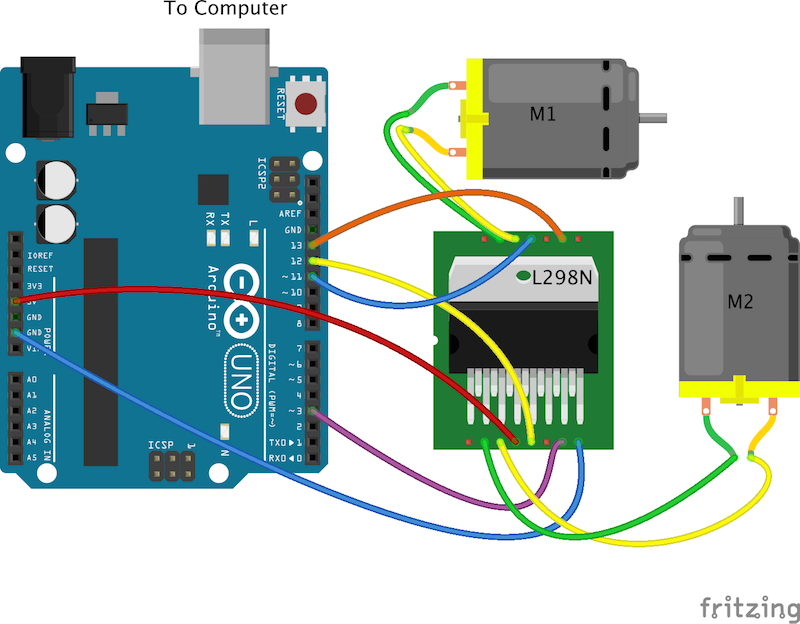 Arduino is an open-source prototyping platform based on easy-to-use hardware and software. It is used in thousands of projects all around the world. The reason we’re using Arduino is that it deals with a cheap and easily extensible cross-platform (it runs on Windows, Linux, and OS X). We’ll start by assembling the hardware. 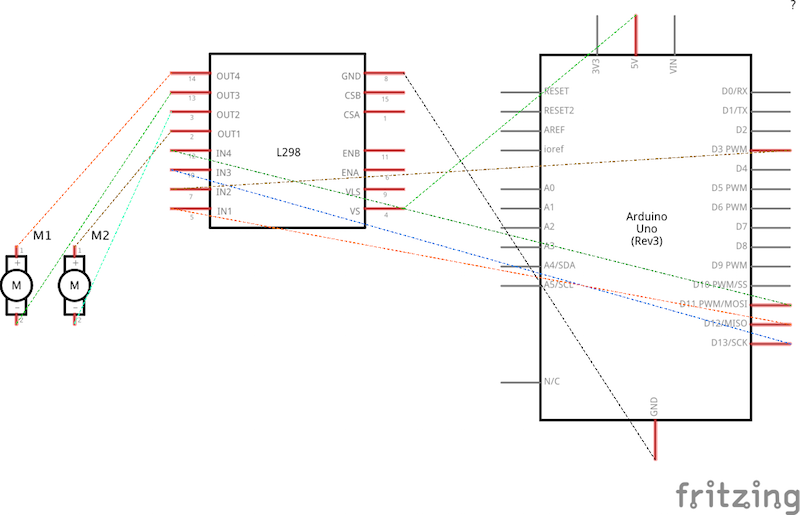 A representation of the connections is given below. In case you find any difficulties in understanding the pin numbers, refer to the schematic diagram given below. I would advice you to select the motors according to your need (for instance, the load it has to bear). If you take a motor of higher voltage rating, then you may have to use an external power source as the voltage provided by Arduino may not be enough. After the hardware connections are done and the StandardFirmata is uploaded on Arduino, we can move to the next section where we’ll create the web application. Run npm install in the root of the project folder after creating the file so that all the dependencies will be installed. If you aren’t familiar with npm, take a look at the article titled A Beginner’s Guide to npm — the Node Package Manager by Peter Dierx. The server code relies on Node.js and Express. We’ll create a file named index.js at the root of our project directory. This file will contain all our server side logic. The express() function is a top-level function exported by the Express module. express.static() is responsible for serving the static assets to the client side. app.get routes HTTP requests to the specified path with a callback function. The res object represents the HTTP response that an express app sends when it gets a request. The sendFile method sends the file from the specific path to the browser. We are using Socket.IO to maintain a realtime connection between the client and the server by harnessing the power of WebSockets and johnny-five to help Arduino in communicating with the server. johnny-five is a Firmata Protocol based, IoT and Robotics programming framework. To start, we create a new instance of Board. Once done, all the logic will be implemented once the board is ready (which means when the ready event is fired). Inside the callback function, we create two instances of a Motor by providing an array with two numbers. Specifically, [3,12] and [11,13] represent the pins of the Arduino to which the respective motors are attached. The speed of the motors are specified with a number ranging from 0 to 255. 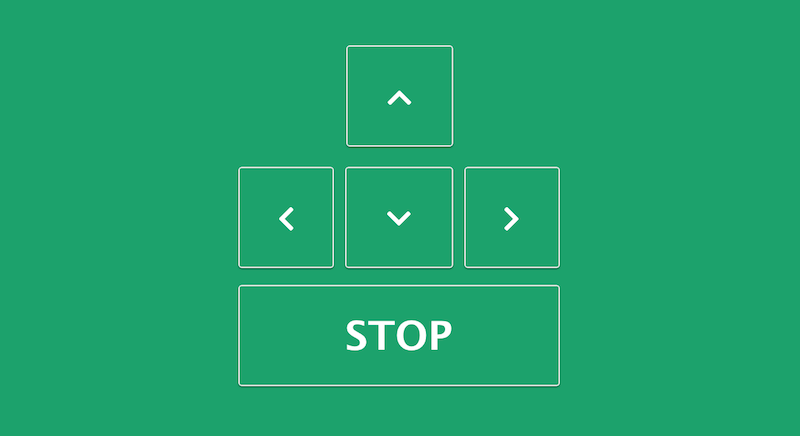 The .stop() method lets the motor coast to stop. There is also an alternative method .brake() that forces a motor to stop (and not coast) but it only works for boards with a dedicated brake pin. The .fwd() and .rev() methods are just aliases for .forward() and .reverse(). All of them accept a number as an argument, ranging from 0 to 255, to control the speed. We are using different combinations of forward and reverse speeds to obtain different movements of the motors. To complete our project, we have to detect when the user has selected a particular option on the client side in realtime. This is where Socket.IO comes into play. The connection event is fired when a new connection with the client is established. Whenever the client emits an event, the .on() method allows us to listen for that event on the server side and perform some actions. The client side implementation involves the creation of the interface where the user can select the different motions of the motors. We start by creating an index.html file inside the app folder present at the root of the directory. In this page, we include the client version of Socket.IO. Socket.IO exposes a global method, that is added on the window object, which is called io(). socket.emit('right') will send a message back to the server with the event name right. Once the .emit() is invoked on the client, the callback attached with socket.on('right') on the server is executed. With this last snippet, we have completed the code. You are now ready to control your motors from your browser. You can even bind keypress events to the arrow keys and control the motors using them. To start the server, open the terminal and run node index.js in the root of the project directory. Now you can visit your webpage at 127.0.0.1:8081 on the browser and start controlling your motors from there. If there are any issues like Board not found, make sure that the connection between the Arduino and the computer is fine and you have correctly uploaded the StandardFirmata from the Arduino IDE to the board. This project was a very small example of what you can achieve by combining Node.js and Arduino. You can use the power of WebSockets to transfer the data received from the sensors (MPU6050) to the browser in realtime. You can show realtime graphs based on that and control the motors based on the readings you receive. A similar implementation on these principles can be found here which is an extension of the current project. If you are interested in the project, you should definitely check it out. In this tutorial, we learned to create a basic NodeBot. At the same time we also explored the various possibilities that Node.js offers and how we can use its power to create a link between web applications and robots. Ritesh is a web designer and developer having a degree in electrical engineering from IIT Roorkee. He loves learning about the new web technologies and getting familiar with new people. When he is not coding, you can find him playing video games.